Pan bible study. The camera pans from a lovely african american girl and a male friend to a woman engaging them in conversation about what they are studying in their bibles. The camera pans from a lovely African American girl and a male friend to a woman engaging them in conversation about what they are studying in their Bibles. The camera pans over from a pretty woman reading from the scriptures to a lovely African American girl and a male friend who are engaged in Bible study with her. 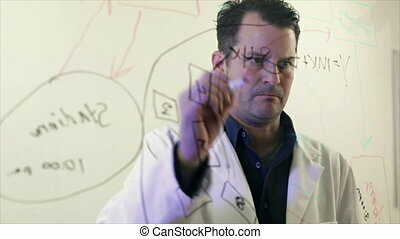 A Bible study group discusses what they are reading from the scriptures. A pretty woman sitting in her living room reading out loud from her Bible. 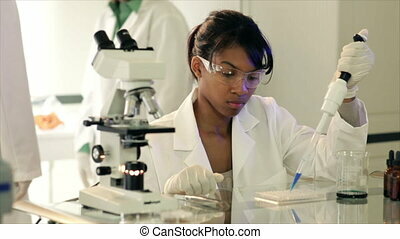 An attractive technician or scientist walks over to a microscope and starts viewing a slide while her pretty African American colleague uses a pipette to extract samples. 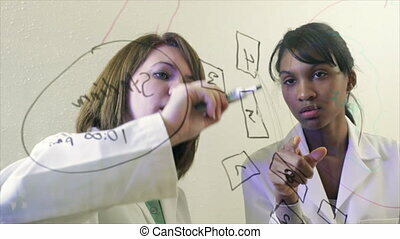 A pretty African American doctor or scientist discusses a diagram her attractive female colleague is drawing on a clear board. 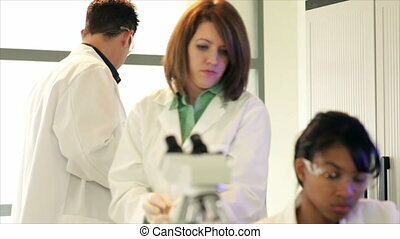 An attractive chemist or researcher walks over to a microscope and starts viewing a slide while her pretty African American colleague uses a pipette to dispense samples. 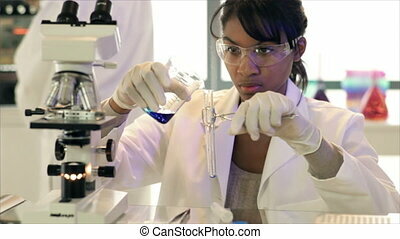 A pretty African American lab tech or chemistry student pouring liquid from a flask into a test tube. 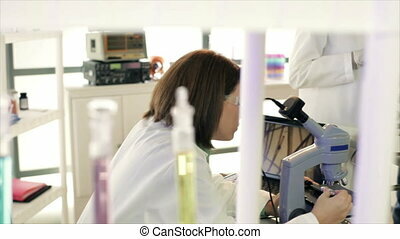 A laboratory technician prepares and places a slide under the microscope while a lovely African American colleague looks at an image displayed on a laptop monitor. 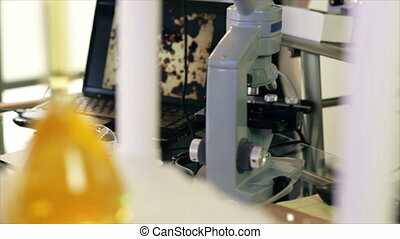 The camera dollies past a set of colorful bottles and other laboratory equipment to a researcher or laboratory technician looking through a microscope. 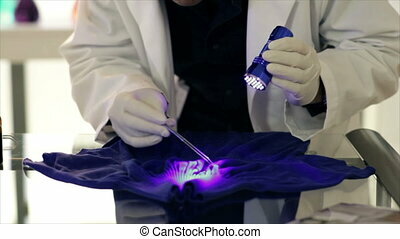 A CSI agent using a UV light to examine evidence on a sweater gathered from a crime scene. 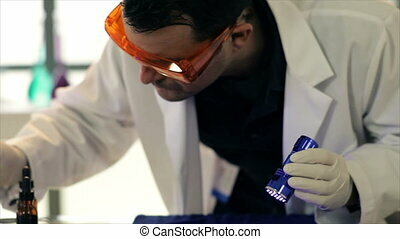 A CSI agent using a UV light to examine evidence gathered from a crime scene. 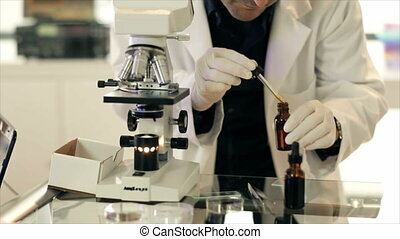 A CSI team working in a laboratory on trace evidence collected from a crime scene. 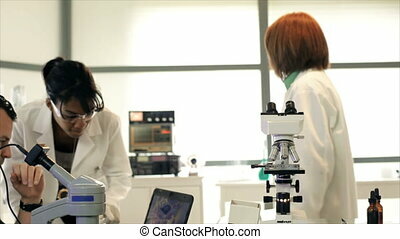 A team of CSI agents and a detective in a laboratory reviewing something they see on a laptop which is connected to a microscope camera.